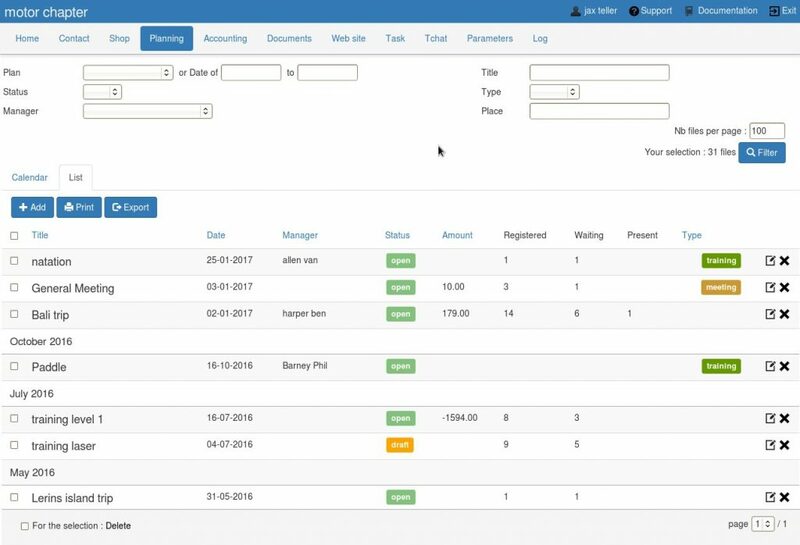 The Kananas software allows you to manage the planning of your activities and the planning of your members. When your activity is repeated over time at regular intervals , you can set a repetition period : weekly, every 15 days or every month. For example, a gym class every Wednesday from 15h to 16h . Warning : the ” frequency” field only appears once the activity is created. The field “to” is required and limits the repetition period. Note that the repetition period can not exceed one year . To set the frequency, you need to change the first occurrence of parameters : “frequency” and “to” . After changing the period or the end of the date, the software will create different occurrences of the activity throughout the desired period. The activities are then linked together and are part of a “series” . The first occurrence of the series is called primary activity. If later you change one of the criteria for the main activity, the software will remove and will recreate occurrences . To change a repeat (managers , place, time … ) stand on the first occurrence. If members are related to the main activity ( first occurrence), they will be duplicated on other activities . This can be useful if for example you always assign the same people to manage activity . If you do not want to affected an activity by the change of the main activity, you must extract it out of the series : then use the “out of the series ” link. This link does not appear on the first occurrence of the activity, only the following . If you want to change the series ( repetitions ), use the “edit” link , it will lead you to the first occurrence of the series. When you assign one or more contacts to an activity, from his file or from the list of contacts (collective editing field ), you can choose if the assignment relates to this session or this session and the followings.